Australia - South Australia/Northern Territory. The Overland Telegraph Line - the international connections. 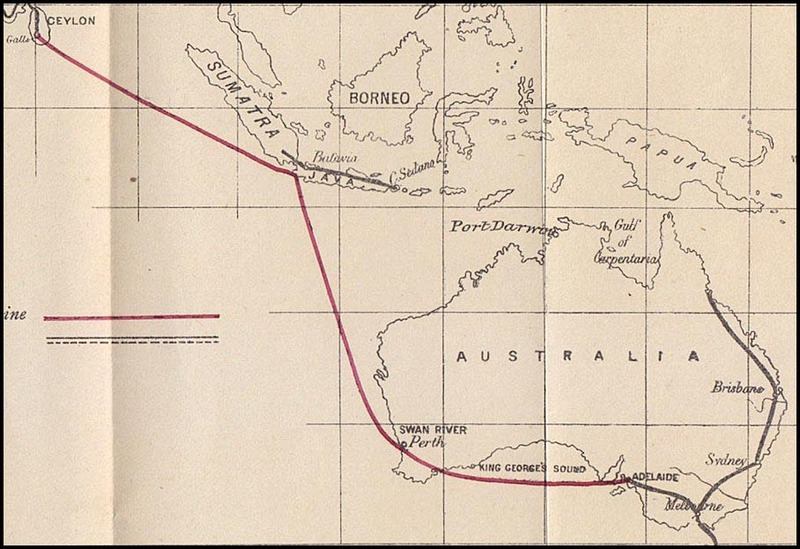 There were several early proposals made as to what route might be the best for telegraphic connection from India to Australia. One strategy, described by McGowan, was based on a very early proposal - in 1854 - by two entrepreneurs Brett and Carmichael. Their proposal was well developed and they even opened discussions with Colonial Australian Governments. They suggested constructing a submarine cable through the Mediterranean and the Red Sea then across to Ceylon and down probably to Western Australia where the Colonial mails first landed. Actions to implement the Brett-Carmichael proposal were commenced but soon abandoned when it encountered major difficulties during the laying of the cable across the Mediterranean Sea. During several difficult times, the constructors lost three lengths of cable between Sardinia and Cape Bon which totalled 233 miles of cable. Cost to manufacture that cable was about £500 per mile !!!! A subsequent cable was laid but failed when the insulation was found to be faulty. 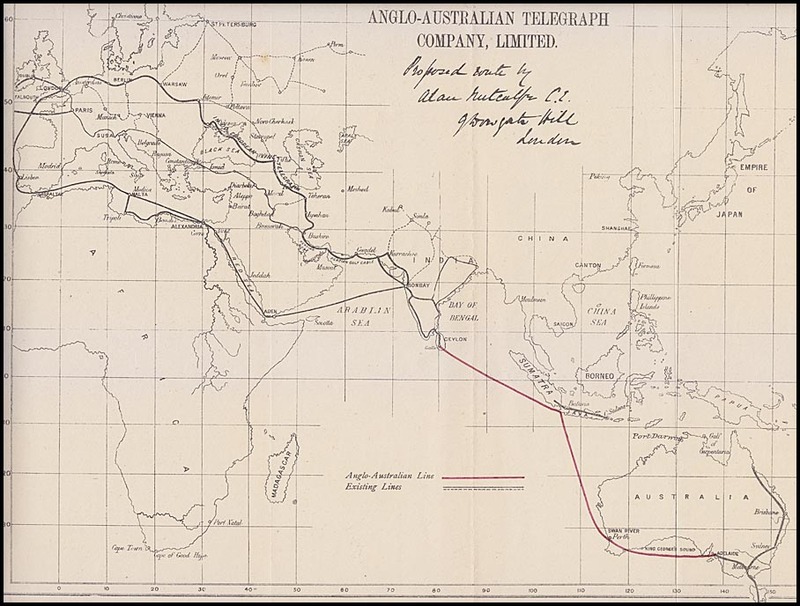 The possibilities of this route were still being canvassed when the Anglo-Australian Telegraph Company was formed in January 1870 through the proposal to lay a submarine cable from Ceylon (Sri Lanka) to Western Australia and then another submarine cable to Adelaide. Map prepared by Alan Metcalf showing both the land and the cable routes from London to Bombay and thence to Perth and Adelaide. Date of this original not known but probably in 1870. Detail of the above map showing the Australian details. Sir, Owing to the late period at which the papers relative to Mr. Francis Gisborne's proposition on behalf of the promoters of the India and Australia telegraphic communication have reached my hands, I find that my almost immediate departure with the Bass's Straits cable laying expedition will preclude my entering into the details of the subject so extendedly as I could have wished or from affording to it the lengthened consideration which its obvious importance clearly demands. My views have hitherto been altogether in favor of a connection with India and Europe via King George's Sound and Western Australia as proposed by Sir J. Carmichael and Mr Brett (both gentlemen of large experience in connection with the development of submarine telegraphs); and, without conceding that there is anything in Mr. Gisborne's proposition at all adverse to my previously expressed opinion as to the practicability and manifest utility of a telegraph connection to the westward to act in unison with our existing mail contract, I would beg to state that the evidently well digested scheme of the promoters of the India and Australia telegraph appears to me as deserving of most earnest consideration. Since the date of Mr Gisborne's communication of the 7th inst, I have had several personal conferences with that gentleman in which I have discussed with him most of the many important points involved in the detail of the project which he has brought forward and the result has been that the evidence presented is, in my opinion, strongly in favor of the route via Java and Singapore, subject at the same time to the several modifications which I have suggested and the necessity for which has been virtually admitted by Mr Gisborne. Admitting the preference in favor of the north-eastern route, it would be necessary to decide as to the advisability of terminating the submarine connections at Moreton Island, as proposed by Mr Gisborne, or of continuing the line seaward to Sydney heads. In the absence of any reliable information as to the exact nature of the existing communication between Sydney and Moreton Bay or of the intentions of the Government of New South Wales as to the extension of their colonial lines northwards, my impressionis in favor of continuing the submarine line to Sydney, as being more likely to prove generally satisfactory to the population already centred to the Southward of New South Wales than if the terminal of the submarine line were to be determined at any remote point north of that colony. The advisability of carrying a line overland from the northern boundary of Victoria direct to some advantageous point at the head of the Gulf of Carpentaria and thence by submarine to Singapore, as already defined. The land lines are preferable to submarine especially on the borders of a new and undeveloped country, cannot, I think be questioned; but where difficulties have to be overcome of the character likely to be presented in traversing comparatively unexplored and remote districts at present occupied, so far as can be learned, by tribes of aborigines, who, if not altogether inimical to the interest of the white man and advancing civilisation, would still probably interfere materially with the permanent success of a line of telegraph, the question assumes a shape the consideration of which is open to the most vague speculation. I am therefore inclined to the belief that, in the present instance, the sea route might be the most advantageous of the two, although I would strongly recommend that before any decision be arrived at, a thoroughly practical examination of both routes should be made and fully reported upon, having in view the practicability of establishing either overland or by submarine telegraphic communication with a stated point on the borders of the Gulf of Carpentaria. Through the excellent means available for such a purpose by the presence of the C.W.S. Victoria on the one hand, and that of Dr. F. Mueller (whose name is intimately connected with the northern exploration) on the other, I think that within a reasonable period, and at a very moderate outlay, some really valuable and definite conclusion might be obtainable and, while stating my convictions to be at the present time, in favor of a sea route, I would still observe that, in the event of a favourable route being found overland, I would recommend its adoption in preference to the submarine for the reasons mentioned at the beginning of this paragraph. I shall leave the consideration of the point referred to in the hands of the Government as the matter will be one with reference to expense of the decision of the several colonial Government interested in the speedy establishment of telegraphic communication with Europe. I have suggested to Mr. Gisborne the advisability of leaving open for future decision that branch of the question which will bear upon the character of the cable to be employed, and I have been met by the assurance that the promoters of the Indian and Australian Telegraph are in no wise bound to adopt either the sample of cable exhibited by Mr Gisborne or the specific estimates referring thereto but that any approved construction of cable may be adopted within the estimated outlay named - say £800,000. I consider that the probable expenditure mentioned by Mr Gisbome is not overstated although I would wish it to be understood that I do not agree with him as to the correctness of the charge proposed for the description of the cable he has submitted for inspection (a portion of the Red Sea line) as I believe that a more durable and more efficient cable might be obtained at a more reasonable cost, judging from the contract price of the Bass's Straits cable now about to be laid down. Although I do not feel that I am required to pass my opinion as to the sum or quota allotted to Victoria in the divisional proportion of Mr Gisborne's scheme, still I would beg to express my belief that the proportions alluded to should not be based on the postal statistics, but upon the number and respective relations of the several mercantile firms in the four chief cities - say, Melbourne, Sydney, Adelaide and Hobart Town - as telegraphic communication with Great Britain and Europe would be essentially beneficial and principally available to the mercantile community and to the conservators of commercial and general information. In conclusion, I would beg to recommend that the government of Victoria should place itself in correspondence with the respective colonial governments of New South Wales, South Australia and Tasmania with the view of eliciting their intentions as to any action proposed to be taken in reference to Mr. Gisborne's scheme. The Hon the Postmaster-General &c.
That this Chamber is of opinion that it is advisable to connect the colonies with England by telegraphic communication and, for that purpose, they would recommend the Government to take such steps as are necessary to carry out the said object in the most expeditious and practical manner. The Secretary was instructed to forward a copy of the above resolution to the hon. the Postmaster General". In his Report on Victoria for 1867, McGowan again described the strategy of extending the telegraph line from Port Augusta through Streaky Bay and Fowler's Bay to King George's Sound. Having telegraph communication possible between the east and western parts of Australia would significantly reduce the time for business and for news from England. McGowan's proposal was for the extended line to meet the mail steamers at King George's Sound but did not, in that context, envisage continuing the line of telegraph further.